Draksharamam also called as Dakshina Kasi or the Southern Banaras is situated in East Godavari district of Andhra Pradesh State. It is 28 Km from Kakinada, 50 Km from Rajahmundry and 40 Km from Rajahmundry. One of the important religious place in Pancharamas and also one among the Ashtadasa Shakti peethas, Draksharamam is famous for its Bhimeswara Swamy temple. The Linga of the Lord, together with that of Mallikarjuna in Srisailam and that of Kalesvara in Kalesvaram gave Andhra Pradehs its ancient name of 'Trilingadesa'. It is one of the five celebrated 'Arama' shrines of Andhra Pradesh. Dates back to the 10th century, the temple was built by Chalukya Bhima, an eastern Chalukyan King of Vengi, a dynasty that was an offshoot of the Badami Chalukyas. This temple is famous for its sculptures and inscriptions and it contains nearly 400 inscriptions. The earliest is dated 1038. The temple is associated with an interesting legend. Once, Daksha, the progenitor of the human race, performed a Yaga near the confluence of the Godavari with the sea. He invites everybody except his son-in-law Lord Shiva because Sati, one of his daughters, had married the Lord Shiva without his consent. Sati, neverthless, goes to attend the sacrifice even though they are not invited. She wanted to go for the Yaga mainly to meet her sisters. But, she was insulted, and she threw herself into fire and ends her life. Angered at this, Lord Shiva rushed to the venue of the sacrifice and through Veerabhadra, destroyed Daksha's Yagnavatika. Daksha's head was cut off and a goat's head substituted for it. After this, Lord Shiva performs Tandavam carrying the body of Sati on his shoulder. The other gods tried to stop this dance. To stop him Lord Vishnu, with his Sudarsan Chakra cuts the body of Sati into 18 pieces. These eighteen parts fell at several spots all through the Indian subcontinent and formed the sites of what are known as Ashtadasha Shaktipeethas. Sati was reincarnated as Uma and married the Lord. Both came to live in Draksharama. The temple stands in two prakaras. The outer walls have single pilasters and four entrances in the outer wall, each with a gopura. The western entrance is the biggest. It is of five tiers. There are many shrines in the first enclosure. The entrance to the second is through the south. 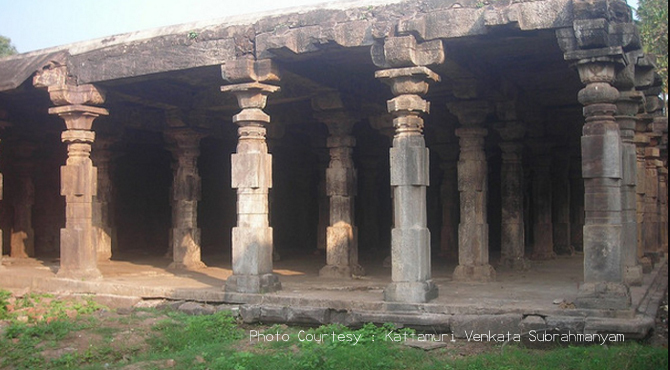 A pillared verandah, in two storeys, runs around the main shrine in the second enclosure. In a corner is the shrine of the Goddess, Manikyamba. In another corner, there is a miniature of the main shrine. The walls of the main shrine are in two sections. The lower encloses the ground floor, the upper the first. Both sections contain sculptural decorations. Two flights of steps lead to the upper floor in two directions. There are many small shrines, mandapas and images in this part of the temple. The presiding deity is the enormous 14 feet Bhimeswara Swamy which is a Spatikakara lingam believed to have belonged to the demom Taraka. The bottom part of the lingam appears in black color and the upper portion appears in white color. This is said to be a symbol of Ardhanariswara Tatwam. As a whole, the temple contains many fine sculptures. The iconography of some of them is of significance and interest. Abhishekam, pujas are performed from the second storey of the temple to the lingam. Maha Shivaratri Festival is the main temple festival which is observed on 28th day of Magha Masam(Febraury/March) every year. Vaisakha Pournami, Sravana Purnima, Karthika Purnima, Vasantha Panchami, Gowri Vratam and SaranNavaratrulu are the other festivals celebrated at the temple.